Earlier this year, BJ, Lilia, Alex, and I each submitted a permit request to the lottery. We were quite shocked that only Alex's request "won" the lottery. Wow, those are pretty slim odds of winning! As I mentioned in yesterday's post, BJ and Lilia backpacked about five miles into the hike yesterday. 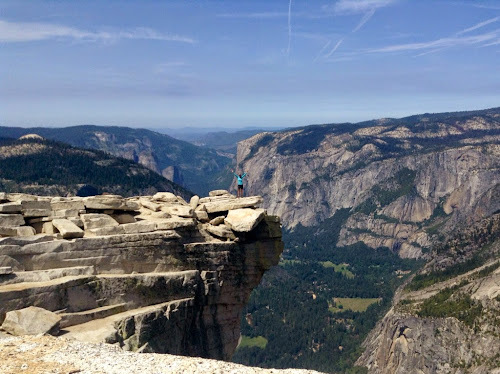 Alex and I decided to do the entire Half Dome as a day hike. 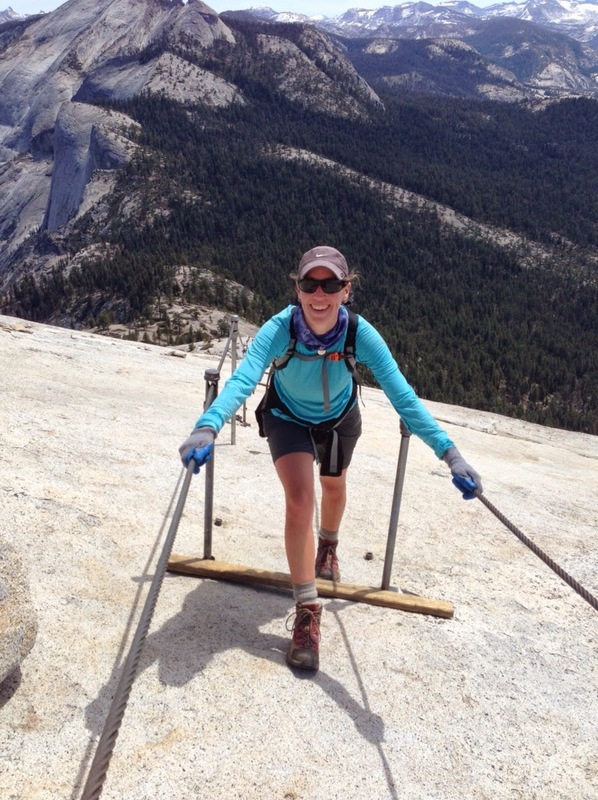 Actually, it took a whole lot of convincing to get Alex to hike Half Dome. He didn't think that doing a strenuous hike on an off-the-bike rest day sounded very restful. But, Alex eventually heard enough people say that the hike was one of those not-to-be-missed types of experiences. In my opinion: we're here, let's do it! I'm glad Alex decided to do the hike. He's probably the only person who has ever had 6-bypass heart surgery and hiked Half Dome...post-surgery. Alex and I left our campsite at 5:55am and walked the mile or so from our campsite to the trailhead. The first part of the trail is aptly called "The Mist Trail." 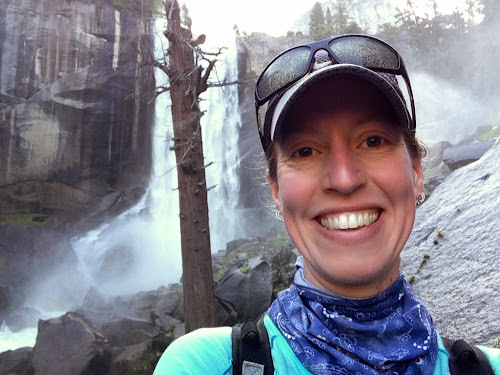 The trail passes next to Vernal Falls, where the spray from the waterfall ensures that you are wearing a thick layer of mist by the time you pass by the falls. Getting misted upon by Vernal Falls. 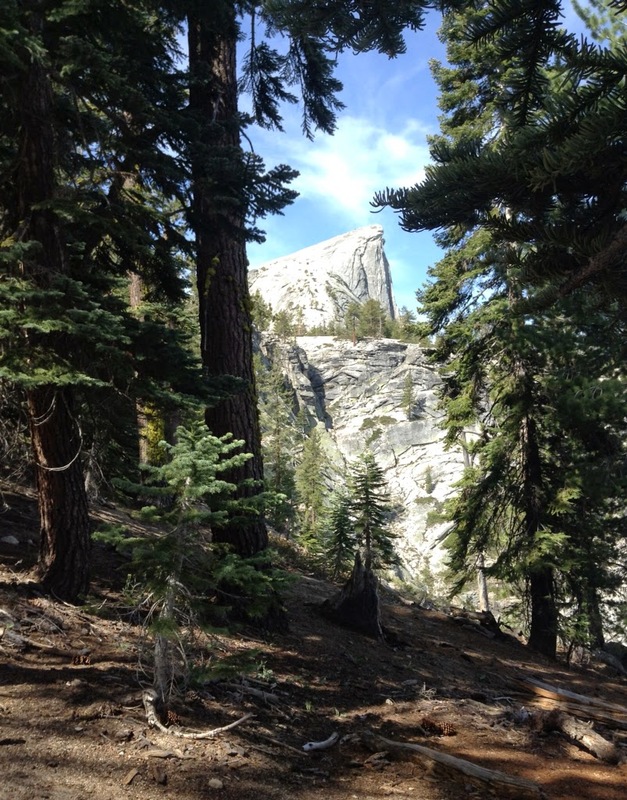 We then hiked the steep section past Nevada Falls. After this point, the trail leveled out quite a bit. Eventually we arrived at the backcountry campground where we met up with BJ and Lilia. We hiked a few more miles. 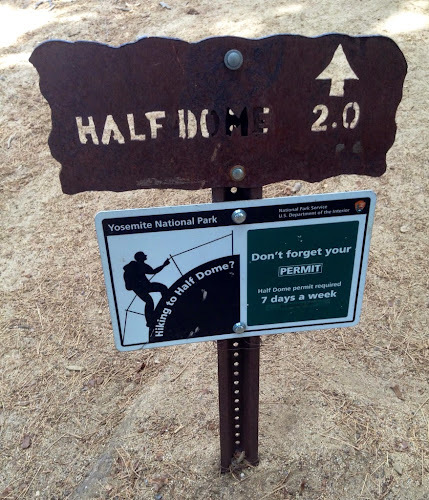 And then there were only two more miles to the top of the dome! Only two miles left to go! We're getting closer to Half Dome. This is a great photo for showing that Half Dome is truly a half dome. We arrived at the area called the "sub-dome," where we were met with a long set of nice, but steep steps. Climbing the stone steps made me think of climbing the steps of an ancient pyramid. The steep steps of the sub-dome. And then we arrived at the cables! In the center of the photo is the 400 ft cable climb. The tiny people on the cables help to give perspective. We had read that it was a good idea to bring gloves for climbing the cables. As such, we brought leather gardening gloves. A hiker who was sitting at the base of the cables recommended that we test our gloves on the cables to make sure they had good enough grip. This was fantastic advice. The grip of the leather gloves was a little slippery. So the hiker advised us to fish through the pile of gloves at the base of the cables to find gloves that had a more rubber-like grip. 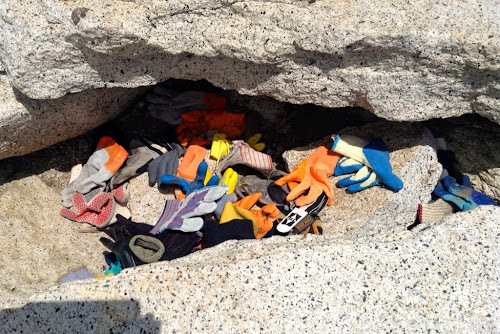 We dug out some gloves from the pile and tested them. Sure enough, the grip was much better. The pile of gloves at the base of the cables. I ended up using the blue and white pair on the right. The cables were super-duper steep. I hadn't expected that so much upper-body strength would be needed to ascend the cables. By the time I made it to the top of the cables, my puny little biceps felt like jelly. Me, near the top of the cables. The steepness of the cables was much less significant at this point in the climb. 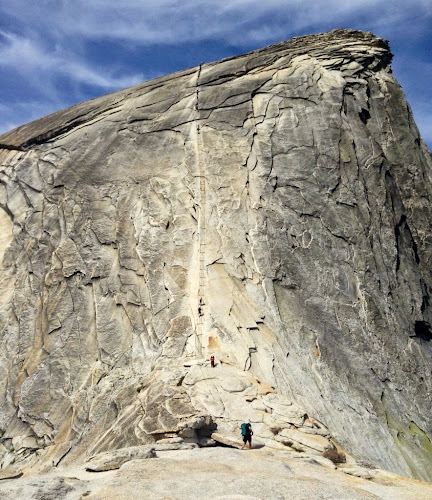 The views from the top of Half Dome were magnificent -- 360 degrees of pure Yosemite beauty. My, oh my! What a rewarding view! Without a doubt, Half Dome is my favorite day hike. Me, standing on the nose of Half Dome, with the valley down below. At the end of my Portland, OR to Portland, ME bike tour last summer, I spent some time hiking with BJ and Lilia in the Adirondacks. I felt as though I was in great shape after my 3,000+ mile bike trip. Cardiovascularly speaking, I was indeed in great shape. But the stiff legs I experienced for three solid days after our hike humbly reminded me that biking and hiking use different sets of muscles. Half Dome is a strenuous hike. And so I expected that my non-biking muscles may revolt for a few days post-hike. 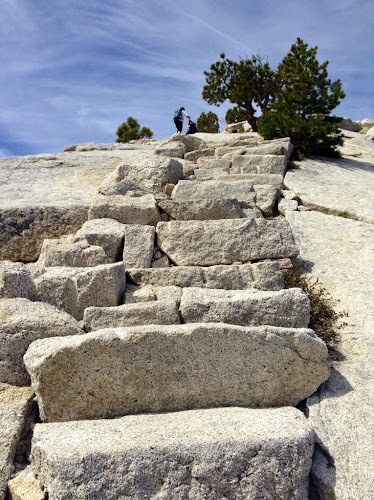 Perhaps Alex and I were a little nuts to take on this hike, as tomorrow we begin our ascent over Tioga Pass. At 9,945 ft, Tioga Pass is our highest pass on the Sierra-Cascades ride. 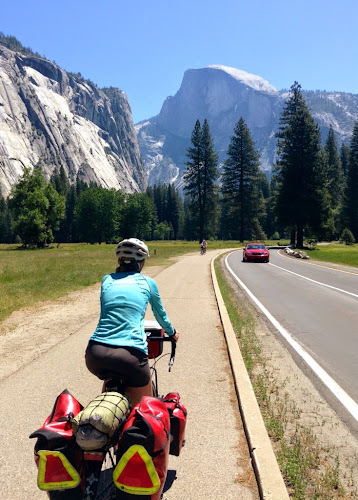 As soon as we got back to camp after hiking Half Dome, Alex and I jumped on our bikes and biked two miles around the valley. Our hope was that using some biking muscles would help to counteract today's overexertion of our hiking muscles. We're already limping as though we're multiple decades older than our true age, but at least we had a whole lot of fun hiking half a dome. Last part of the hike looks pretty scary. Do you think this hike beats the angel's landing in zion park? Now, I have another must do in my list, thanks to you.